Last updated 3 years ago by ammanvedi . Please Note: This is currently a work in progress ! 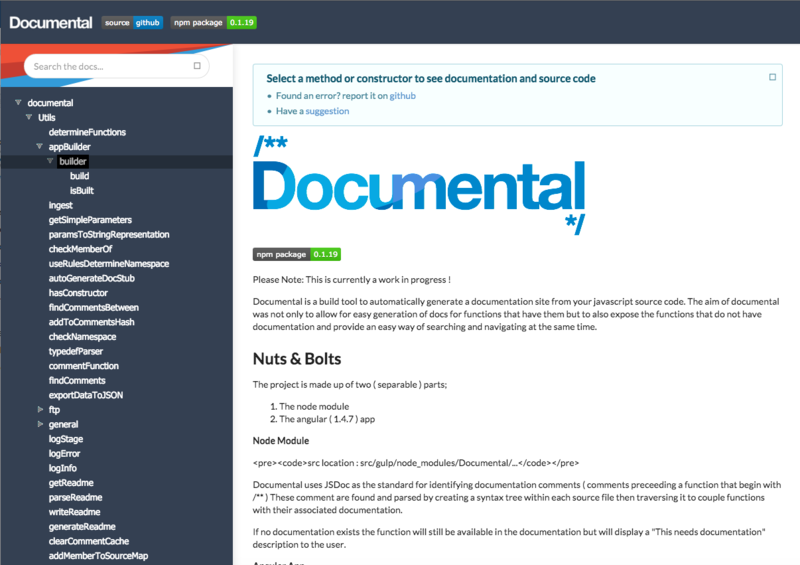 Documental uses JSDoc as the standard for identifying documentation comments ( comments preceeding a function that begin with /** ) These comment are found and parsed by creating a syntax tree within each source file then traversing it to couple functions with their associated documentation. If no documentation exists the function will still be available in the documentation but will display a "This needs documentation" description to the user. --ftp however you decide to include the call to documental in your build you can pass this CLI flag into the task ( e.g. gulp docs --ftp ) which will initiate an ftp upload as well as building the docs. A configuration file documental.config.json should be placed alongside the gulp file that you use to build your project. this configuration is required should you decide to use the bundled angular app to display your docs. At the very least an output location should be provided. menuTree.json A menu tree is also generated, levels and nesting are decided by the namespacing of functions. within the the Angular app a slightly changed version of EasyTree is being used ( fork at my github ) currently to generate the tree view of the source, the format of this tree follows the easytree format. sourcemap.json The main meat of the operation is located in the sourcemap. This contains the source code of each function as well as other neccacary properties such as its namespace and any associated JSDoc tags. These files can now be consumed however you choose! you can now adjust test.gulpfile.js to point to the desired files and run the documentation task. Note; if you want to use the app when building from source, make sure you have built this also. The process is outlined below. examples can be found in the already existing plugins. The documentation can be accessed through the Angular app using the project name that was given to the documental.config.json file.